Which Scrivener template should you choose? That depends on what you’re trying to do and how you plan to set up your project. Here are some hints on picking a template for your next project. What is a Project Template, Anyway? A template is a framework on which something is based. A copy is made and then you can add your own elements. Most software works with templates. Even the blank document in Word or Pages is a template with properties like margins, font, font size, and spacing already set up. 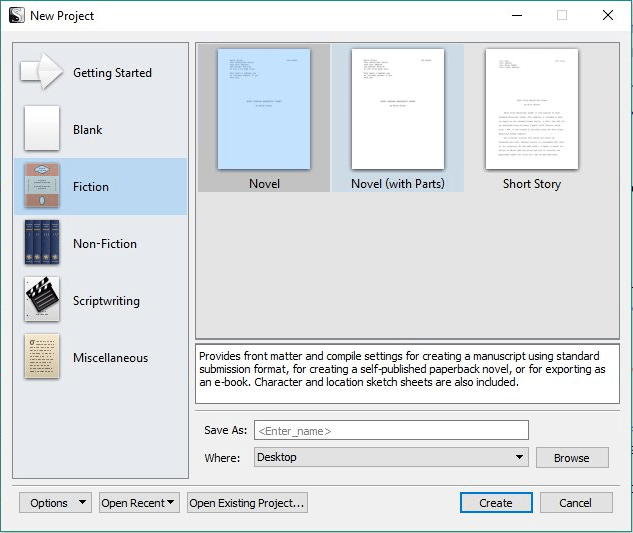 All Scrivener project templates are based on the Blank template—which is nothing but the basics—and have additional files and folders, and different settings baked in. The Blank template is the most basic option for your project. Contrary to my examples in Scrivener For Dummies, I now think Blank is the best place to start for new users because there aren’t so many distractions and confusing files to figure out. Blank comes loaded with the three core folders that can’t be deleted: Draft, Research, and Trash. To get you started, there’s an empty Document in the Draft folder. That’s it. Just click in the blank document and start typing. The Compile format is initially set to “Original,” meaning that it will print everything as you have it formatted in the Editor. So, every other template is a Blank template with extra stuff in it. Like what? Things the developers thought might be handy for the type of work you’re doing. For example, a renamed Draft folder (e.g. Manuscript, Screenplay, Short Story), additional folders like Characters and Front Matter and Notes and Template Sheets, each with their own special icon. Each template also comes with a format note, explaining how the project is set up, which compile preset is chosen by default, and how to make some key changes. There’s good stuff in here—worth the read—but when you’re done with it, you can delete it. Or move it somewhere else. You can also delete the Sample Output documents in Research, if desired. They’re there to show you what you can create using the instructions in the format note. Basically, you can move or rename anything you want, and you can delete anything except the three core folders. The templates geared toward long-form writing are set up with the assumption that you’ll organize your work into chapter folders that contain scene/section subdocuments. 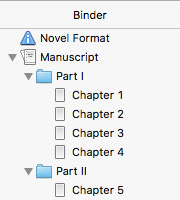 The only time I recommend choosing a template with parts is if you plan to organize your chapter folders into part folders (as shown below). It comes pre-loaded with that layout, and this often has writers thinking that they must work this way in Scrivener or they’re doing it wrong. If you have Part folders, but every chapter is a single document (see below), don’t pick this template. 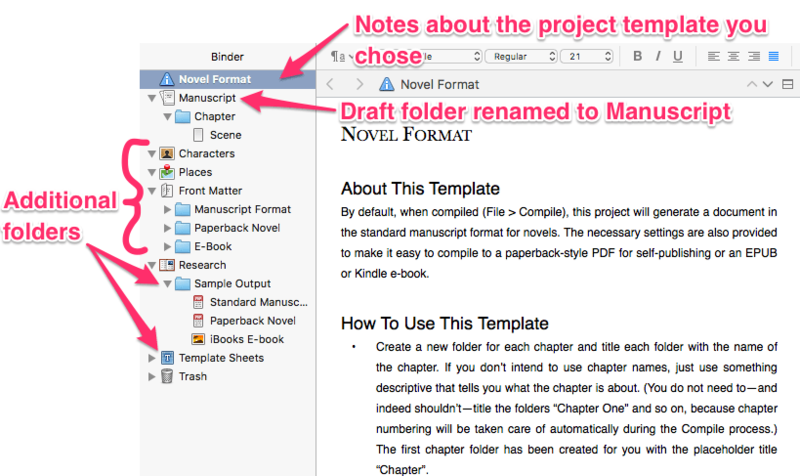 Instead, choose the Novel or Nonfiction format and rename the Chapter folder to Part n, or use the Blank template. There’s no way to change the template of a project once you’ve created it, so if you start writing and realize you’re unhappy, you can simply create a new project based on the template you want, and import your working project into it (File—>Import—>Scrivener Project). Once you get comfortable adding, moving, and deleting documents and folders, it doesn’t much matter which template you select. 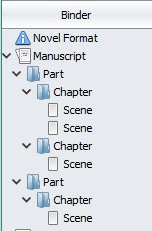 If you like the document templates in the Novel template but don’t use folders, simply delete the Chapter folder and start with a new document in Manuscript. Or make your own document templates and Template Sheets folder. If you want the project settings to be different, change them. And when you have a better idea of what you like in a project template, you can create your own. So, what’s your burning template question?